Home » Reference Section » Now on Facebook: What is a Reverse Mortgage? Now on Facebook: What is a Reverse Mortgage? 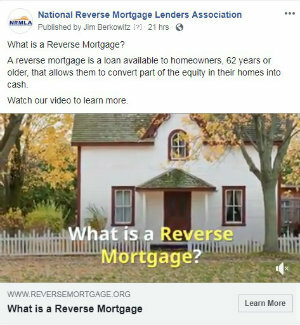 Watch and share this brief video introduction to reverse mortgages on NRMLA’s Facebook page. The 86-second video links to NRMLA’s consumer education website www.reversemortgage.org. A version of “What is a Reverse Mortgage?” is also posted directly on the website.